Forests harbor vital genetic diversity and are home to the majority of the world’s land-based plants, animals and other living organisms. This means that forest degradation and deforestation contribute considerably to a global loss of this biodiversity and ecosystem services. Thirteen million hectares of forests are lost every year while the persistent degradation of drylands has led to the desertification of 3.6 billion hectares. Forests cover 30 percent of the Earth’s surface and, in addition to providing food security and shelter, are key to combating climate change, and the protection of biodiversity and the homes of indigenous populations. 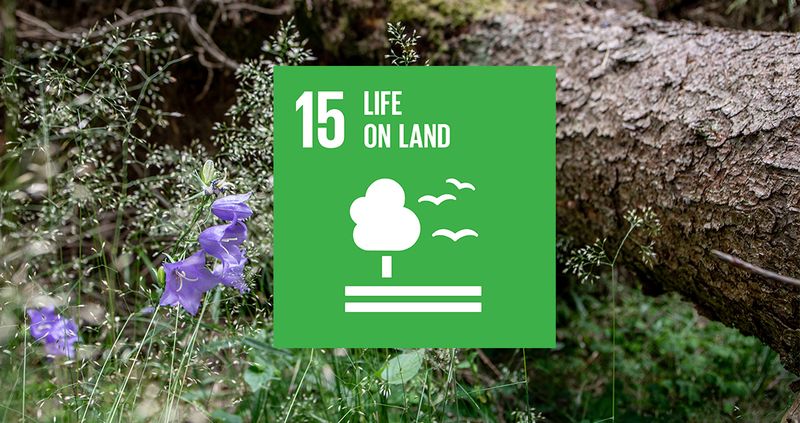 FSC contributes to goal 15 of life on land by providing a system for responsible management of forests worldwide for this and future generations. FSC aims to combat the loss of biodiversity through a balanced extraction of forest products. The FSC certification system ensures the protection of valuable natural forest areas and species, fights illegal logging, and supports the implementation of integrated landscape management policies - including reforestation and forest restoration programs. The FSC forest management standards require forest managers to prevent deforestation, avoid forest degradation, and maintain biodiversity and ecosystem functions. Only those forest managers that meet and maintain these standards are granted FSC certificates. Applying the principles of FSC in forest restoration and afforestation projects can encourage the creation of multi-functional forests, with benefits beyond the borders of the project. Certification can also enhance the economic potential of such projects. • 5.2 The Organization shall normally harvest products and services from the Management Unit at or below a level which can be permanently sustained. • Principle 6: Environmental Values and Impacts. The Organization shall maintain, conserve and/or restore ecosystem services and environmental values of the Management Unit, and shall avoid, repair or mitigate negative environmental impacts. • Principle 9: High Conservation Values. The Organization shall maintain and/or enhance the High Conservation Values in the Management Unit through applying the precautionary approach. • A study from the Maya Biosphere Reserve in Guatemala (Hodgdon et al., 2015) confirmed that FSC-certified areas do this much better than legally protected sites in the same national park.